The all-new 2018 Ford Expedition has earned the highest possible crash test rating of 5 out of 5 stars from the US-based National Highway Traffic Safety Administration or NHTSA. This makes the aluminum-bodied Expedition the clear safety leader in the full-size SUV category. 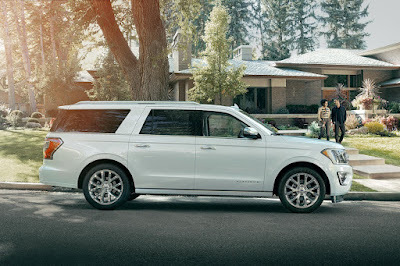 Ford credits the Expedition’s improved performance thanks to the use of high-strength, military-grade aluminum alloy on its body which not only makes it much safer, but because it weighs 147 kilograms less, it lowers its center of gravity for enhanced stability and driving dynamics. In addition, the Expedition is equipped with dual seat belt pyrotechnic pretensioners in the anchor and retractor, which contributes to safety, helping to keep occupants in place in the event of a crash. Apart from improvements to its body and frame, the all-new Expedition also offers driver assist features such as Cross-Traffic Alert, Pre-Collision Assist with Pedestrian Detection, auto high beams, and enhanced active park assist. All in all, they promote greater driver confidence and control. Safest except for your wallet, it consume diesel as if there was no tomorrow. Would it be possible for Ford to offer the F150 Diesel’s 3.0-liter Power Stroke V6 engine in the Expedition lineup?